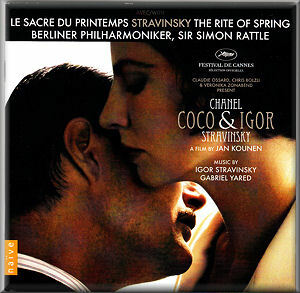 This disc contains the soundtrack to the 2009 Jan Kounen film Coco Chanel & Igor Stravinsky. The main attraction on the disc is the magnificent 2003 Berlin performance of the complete The Rite of Spring (Le Sacre du printemps) from the Berlin Philharmonic under Rattle. Now my first choice version of the Stravinsky score I don’t believe this superb performance is available anywhere else on CD. Jan Kounen’s film describes episodes in the moving love story between the Russian composer Igor Stravinsky played by Mads Mikkelsen and Coco Chanel the French fashion designer played by Anna Mouglalis. The film opens with a fifteen minute re-enactment of the riotous 1913 première of Stravinsky’s The Rite of Spring under Pierre Monteux for Diaghilev’s Ballets Russes at the Théâtre des Champs-Élysées in Paris. It has been put forward that the unruly scenes at the première may have been started by a claque. Subtitled by the composer as ‘Pictures from Pagan Russia’ Stravinsky divided The Rite of Spring (Le Sacre du printemps) into two sections. In first section - Adoration of the Earth - the Introduction is a convincing depiction of the spring-like renewal of nature with some of the woodwind having an otherworldly quality. The quite glorious opening bassoon solo has an earthy reediness. With the gripping and stamping Harbingers of Spring - Dance of the Adolescents Rattle provides a shattering atmosphere of menace and violence punctuated by bubbling woodwind figures. The only relief is the fresh and free-spirited central section that permits time for a short breather. The continuing tension is hard to bear with the steely and war-like Ritual of Abduction. Commencing with flickering and rotating woodwind motifs Spring Rounds quickly builds to a heavy an unnerving sense of anger and aggression. From 2:09 Rattle vents the full weight of the orchestra’s brutal power. Briskly moving, savage yelps and earth-shattering pounding take centre-stage in the Ritual of the Two Rival Tribes. A light and beautiful theme on the strings makes unsuccessful attempts to break through all the clamour. Throughout the Procession of the Sage a nerve-bursting disturbance dominates which is almost too much to bear. A short respite is provided in the Adoration of the Earth: The Sage with a dreamy passage. In the closing section of the first part the Dance of the Earth Rattle unleashes a barbaric outburst of toxic aggression and a power that seems unrelenting. The second section of the ballet - The Sacrifice - begins with the Introduction: an eerie interlude of relative calm. The music shimmers with impressive contributions from the Berlin woodwind. Rattle ensures that an undercurrent of dark foreboding is always present. In the Mystic Circle of the Adolescents it feels like glimmers of hope are to be found in a tormented world yet disturbingly one is selected to be sacrificed. Venomous and unrelenting hammer-blows of doom-laden conflict suffuse the Glorification of the Chosen One. The Evocation of the Ancestors sees a brief cooling down of the tension. Rattle generates a heady and intoxicating atmosphere of optimism in the Ritual Action of the Ancestors. An episode of stormy aggression provides contrast. Stravinsky twists, stretches, rips and claws at his rhythms and harmonies in the Sacrificial Dance of the Chosen One. This rises to a shattering climax. The simple yet haunting Andante from Stravinsky’s Five Easy Pieces affords a brief but welcome respite from all that upheaval. The piano soloist is Christophe Bukudjian who follows on with Stravinsky’s even shorter and joyously carnivalesque Moderato from The five fingers (Les cinq doigts). A version of Moderato from The five fingers is heard again as the final work on the disc. It appears this time in a scene taken from the film and includes the voices of the two actors. The remainder of the disc comprises attractive original music composed for Coco Chanel & Igor Stravinsky by Gabriel Yared. He is best known for the award-winning scores to The English Patient (1996) and The Talented Mr. Ripley (1999). In the atmospheric Préambule the music gathers a steely weight suggestive of an orchestra tuning up. Strings and woodwind provide a dreamy love theme in Coco & Igor. Départ pour Grasse has a wistful sense of forward motion on a glorious day. Les Amants is a beautiful dreamscape and the poignant and melodic La lettre is filled with deep feeling. Eerie, tortured visions in Désaccord Parfait underlie an uneasy calm. The relentless and rhythmic La Balancelle suggests deep thought and Parfums du passé continues in a related vein of tenderness and distinct vulnerability. There is a gathering tension in Derniers instants that disguises the mood of the outcome. The briskly flowing Générique de fin is highly passionate and the concluding piece Evocations feels intimately contemplative providing a deep sensory effect. Undoubtedly the vast majority of interest in this electrifying account of The Rite. Rattle and the Berlin Philharmonic are in quite magnificent form.